Our sausage and Cubanelle omelet is a tasty meal, and it is nearly impossible for your kids to skip their lunch or breakfast. Cubanelle peppers add flavor and color, and sausages add protein and extra nutrition. This isn't a classic omelet recipe - our omelet is a great mix of nutritious ingredients for a healthy meal. It is easy to prepare on a busy day or for a holiday brunch. It is a truly delicious egg bake that tastes terrific and is as healthy as the original recipe and why not healthier? Melt 2 tbs of the butter in a frying pan and cook the sausage and pepper until golden (about 2 minutes). Then add the eggs, salt and the pepper. 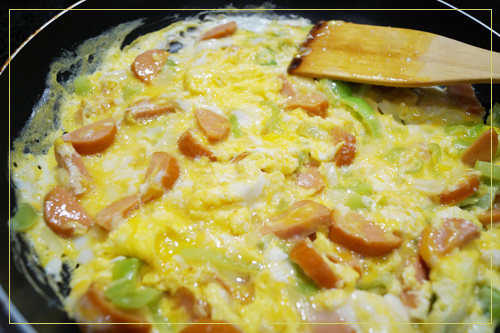 Cook until the eggs are to your taste, until just set, about 3 minutes. Sprinkle the omelet with the Cheddar/Tex-Mex on one side; fold the other side over. Use a spatula to slide the omelet onto a plate and serve.